Some time ago I read and reviewed Victorian People and Ideas, a book that I described as a ‘light touch intellectual history’ that explored the mental furniture of characters in the canon of Victorian Literature. As you might guess from the title of this book, it has a similar intent but it’s Mills and Boon in comparison, and not so much about mental furniture as the actual furniture that Elizabeth, Anne, Tess et al might have sat on. No concerns here about periodization- Austen, the Brontes, Trollope, Hardy- they’re all bundled in together with nary a thought about the wider political and physical world outside. 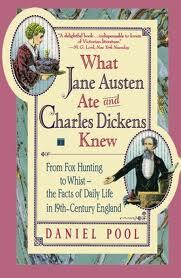 The book is a cradle-to-grave, upstairs-to-downstairs explanation of the domestic and social world of the characters one might find in Victorian literature. It explains clothes, food, business practices, social manners and expectations etc in a rather whimsical fashion. It doesn’t take itself too seriously, and you don’t really need to have read particularly widely to enjoy it. It is divided into two parts- the first is organized thematically, while the second part is a glossary of particular terms and phrases that you’re likely to encounter in reading Victorian novels. The author is American, and the book felt a bit like a travel guide from the self-assured comfort zone of Americana into the weirdness of British life and customs. It’s written in a breezy style and you can easily pick it up and put it down again, but I found that very little actually stuck with me- with two exceptions. One was his explanation of entail and inheritance, which is of course so important to Victorian novels, and the other was his description of promissory notes. I see that the author is a lawyer, and I think that he put his skills to good work here. I know that the book is not intended in any way to be an academic tome, but I did find myself frustrated that there were no footnotes or references at all. You were just left to trust him and not question too deeply. Still, the book is intended as a bit of a hoot, and in that way it probably fulfils the promise of its catchy title perfectly.